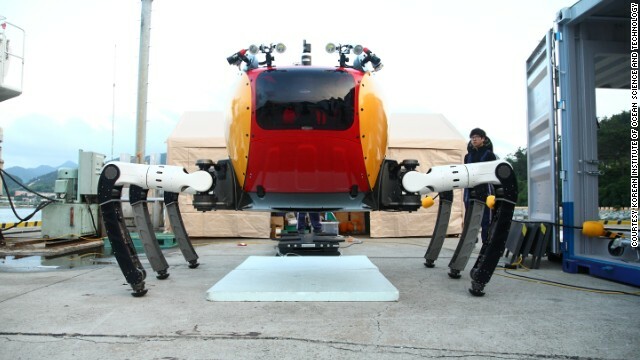 The Crabster CR200 is an underwater exploration vehicle developed by the Korean Institute of Ocean Science and Technology. It weighs more than half a ton, and moves along the sea floor at a leisurely 10 cm/second. The Crabster's multi-jointed, six-axis front legs allow it to manipulate objects, and store them in the front compartment. Its maiden voyage will come in May 2014, in the Yellow Sea. "The mission will be excavation of ancient artifacts by cooperating with marine archaeologists," said lead researcher Bong Huan Jun. "CR200 will do precise seafloor mapping of the turbid area with acoustic equipment. We will also try a number of possibilities of CR200's role for underwater excavation." It is deployed using a tether and controlled remotely. It navigates using video cameras, but also has sonar capabilities for murky waters. 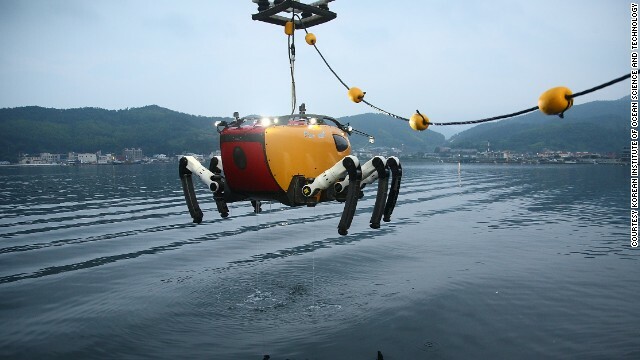 It underwent its first underwater tests in June 2013 in Geoje, South Korea. "I expect there will be demands in scientific fields if Crabster does well in its sea trials," said Huan Jun. "Then many other Crabster will be possibly manufactured for use across the world." (CNN) -- Monsters of the deep will have a man-made horror to contend with, as the Crabster CR200 is released into the oceans. 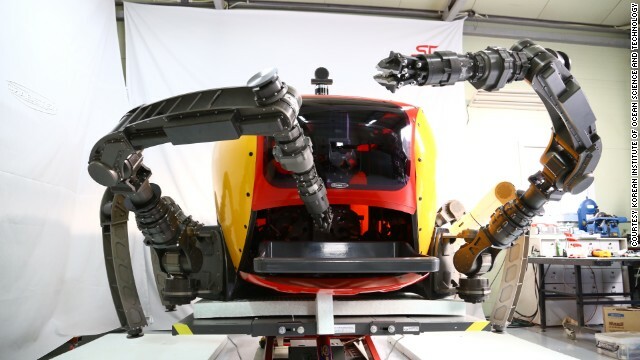 Weighing over half a ton, the six-legged, crustacean-inspired robot is intended for the most dangerous undersea exploration. 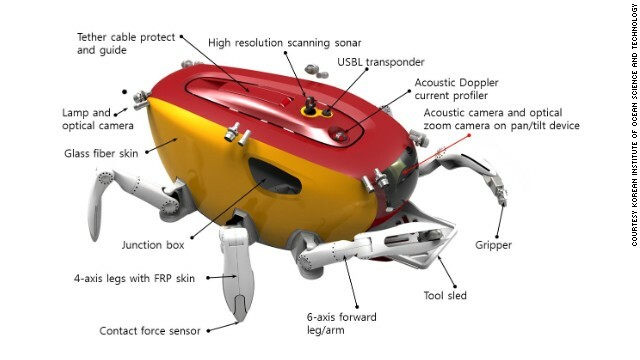 Developed by the Korean Institute of Ocean Science and Technology (KIOST), the Crabster offers a solution to a longstanding problem. While propeller-driven craft do not work well in fierce tides, and divers are limited to calm, relatively shallow seas, the new machine mimics the design of crabs and lobsters that live in stormy waters but are still able to control their movements. The Crabster is 2.4m long, 2.4m wide and 1.3m tall -- rising to 1.8m when it stands up. 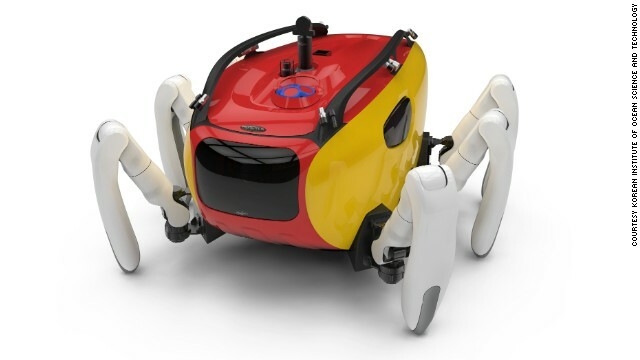 Including payload it weighs around 650 kg, and its six legs contain 30 motors, giving the remote pilot ample control and dexterity. As the Crabster creeps along the ocean floor, it can adapt its posture to different current or pressure conditions, to a depth of around 200 meters. Using sonar, it scans the landscape for objects of interest, and can relay images through onboard cameras. CR200 will help divers or work instead of them in harsh environments. It also could assist in locating underwater resources. Crabster is undergoing final tests in "aggressive waters" ahead of its first mission. In May, it will be hunting for ancient artifacts in the Yellow Sea, where existing crafts have failed. Lead researcher Bong Huan Jun told CNN the machine had performed "very well" in tests, but was undergoing constant modification. "We are performing tests nearly every day," Huan Jun told CNN. "We upgrade Crabster software for more stable and fast walking and manipulation." 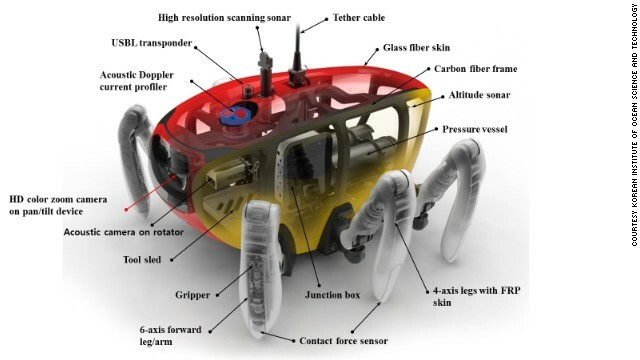 The researcher says the robot's speed of just 10 cm/second is one of the main challenges his team face, along with enhancing the vehicle's stability in strong currents and on rough terrain. 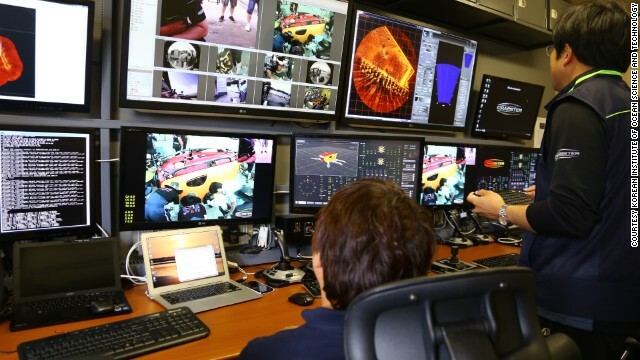 The underwater vision system is another priority. But should Crabster succeed in its maiden voyage, Huan Jun predicts a widespread impact. "We suppose CR200 can conduct seabed mapping, survey and inspection of wrecks, pipelines, ecosystems and pollution down to a 200-meter depth. CR200 will help divers or work instead of them in harsh environments. 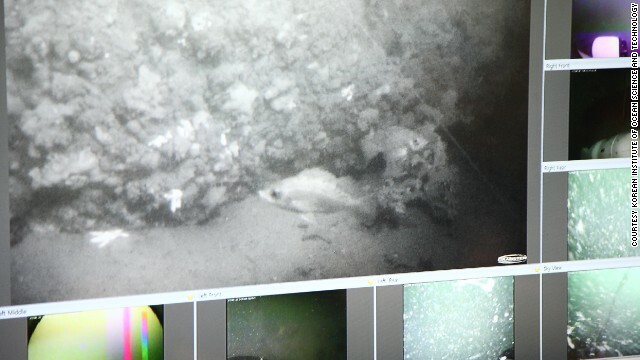 It also could assist in locating underwater resources, carrying out underwater mining, and responding to oil spill incidents." Huan Jun hopes his creation will be manufactured for use across the world, and is already looking ahead to future incarnations inspired by nature. "We are now studying to make the Crabster to swim like turtles or diving beetles. And we are also considering the hydraulic Crabster for heavy-duty underwater working." And are the researchers expecting their machine to be accepted in the marine environment? "I don't know if the animals treat the Crabster as a real crab or not," says Huan Jun. "I thought fish like it more than the other underwater vehicles with propellers that make noise. I hope animals treat Crabster friendly." As of its introduction this year, any swimmers that come into contact with the robot may hope for the same treatment.